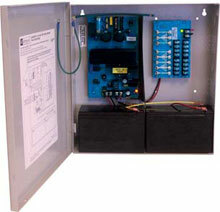 Convert a 115 VAC/60Hz input into eight (8) class 2-rated 12VDC or 24VDC power-limited outputs. The Altronix AL400ULPD8 Power Supply-Charger converts a 115 VAC/60Hz input into eight (8) Class 2 Rated 12VDC or 24VDC power limited outputs. These outputs are filtered and electronically regulated. AL400ULPD8 Power Supply-Charger has short circuit and thermal overload protection. It has a built-in charger for sealed lead acid or gel type batteries. It has a gray enclosure. AL400ULPD8 Power Supply-Charger is UL/CUL listed. The Altronix AL400ULPD8 is also known as ALT-AL400ULPD8	.